Many years ago, this community helped create a public health facility that became the Sharon Regional Hospital and most recently, the Buhl Regional Health Foundation. On May 8, 1893, Sharon’s population was 7,000 when the Sharon and Sharpsville Charitable Hospital was incorporated. This hospital was created to meet the demands of community healthcare problems, some of which were caused by inadequate sanitation. Most of our local diseases stemmed from bacteria and a stagnant canal bed that cut through the center of the Shenango Valley. It had been closed for two years. Diphtheria was prevalent and smallpox struck frequently. During the cold, damp winters, pneumonia and pleurisy claimed many lives. Anyone who lost weight, ran a fever and became listless was diagnosed with typhoid. No one knew that unpasteurized milk was a cause of illness. Tuberculosis was prevelent. The community also had many surgical needs, but a kitchen table under lamplight was less than optimal. On May 5, 1896, a new hospital named after Christian H. Buhl, had its grand opening. The Sharon Herald called the new facility, “a cracker box of red brick.” There was no basement under the operating room. Doctors described working there was like standing on a cube of ice. Patients paid $5 for their room. There were 18-beds in the building. The Valley’s first female doctor, Phoebe Brooks, was part of the Women’s Ward. By 1903, two, 12-patient wards had been added. There were 12 private rooms, two large and two small wards. Overcrowding sometimes forced patients into sun parlors. 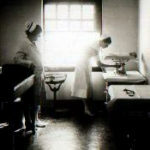 Nurses lived on the third floor and worked 10-12 hour shifts before taking night classes from the medical staff. 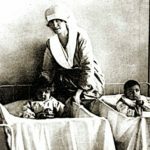 By 1927, the 108-bed hospital was state-of-the-art. However, those with mental illness were not admitted, and those with contagious diseases were taken to a house on the edge of town. Another addition was built in 1939 with the help of money raised from the community. The third floor was rebuilt and the fourth floor was replaced with a Maternity Department. In 1942, there were 1,438 babies born. At that time, the facilities were improved to better accommodate the demands of war workers, soldiers and their families. 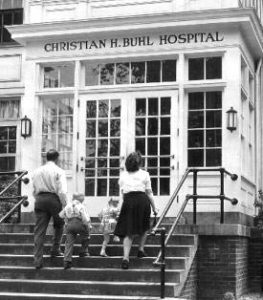 In 1949, the name, “Christian H. Buhl Hospital” was changed to “Sharon General Hospital”. To more accurately describe the hospital’s expansion in capabilities as well as geography, the board of directors renamed Sharon General Hospital to Sharon Regional Health System (SRHS) in 1988. In 2014, the non-profit, SRHS was sold to Community Health Systems (NYSE: CYH) of Franklin, Tennessee. The Buhl Regional Health Foundation (BRHF) was formed in 2012. You can learn more specific details about the formation of the foundation here. You can also learn more information regarding the history, the formation, and the objectives of the foundation, here. We remain committed to supporting the people of our area achieve and maintain healthier lives. Quite simply, we wish to continue this community’s legacy of improving health and well-being through philanthropy.